This month I have decided to have fun with my blogger friend Laura “Big House, Little Prairie” She has posted a picture prompt a day for the month of December. Click on the link I added here if you too want to join us. Today, December 1st is (nourish) and it couldn’t be a more perfect word for today because I have also decided to join my blogger friend Michelle as we begin a journey of intention for 7. This just means for seven days straight I will pick just one intention to focus on. I have decided that although my personality wants to pick at least one dozen things to focus on, I will only choose one. This is going to sound silly for a good handful of you but my one intention is to just eat breakfast every day. After so much thought about what I might do for seven days in a row, it came down to eating breakfast. I have tried this many different times always to return to my old ways. My old ways include not eating breakfast and just drinking a few cups of coffee. This isn’t very good for me because since I work part-time I don’t take a lunch. This means I will often just function on coffee until I get home from work and then I may have my first meal at around 2 in the afternoon. I’m completely abusing my body. I hold extra weight and I have higher chances to get heart disease or diabetes. All because I skip the most important meal of the day. Again one of those things I KNOW isn’t right, yet I continue with this bad habit. I have started early. 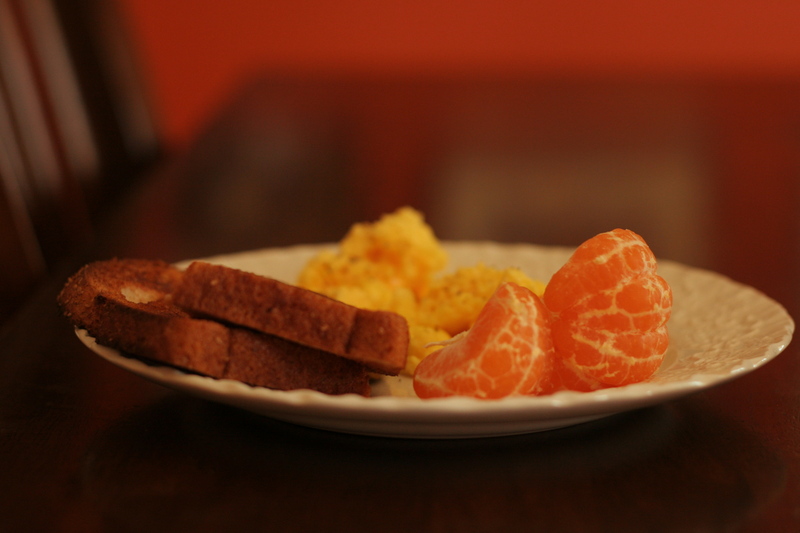 The past three mornings I have had a fairly good breakfast. Posted on December 1, 2013 December 1, 2013 by Life in the Wylde West	This entry was posted in Blogging, every day moments, gratitude, health and diet, healthy choices and fun outings, joy, lots and lots of joy, nutrition, parenthood, peace, photography, Postaday and tagged breakfast each day, picture a day for December, seven days of intention. Bookmark the permalink. YAY YOU. looking forward to following along this week as you nourish yourself every morning! What a beautiful word to think about. Lovely. tracie, i’m so happy to have you joining this week of intention. and i’m loving what you’re doing…so good already. Nourishing your body also nourishes your spirit. 🙂 Your breakfast looks delicious, Tracie! I always have good intentions breakfast-wise too. Most days, though, Im just lucky to get out of the house with pants on. Good luck!